The Immigration Law Clinic advocates for vulnerable immigrant populations, including abused, abandoned and neglected children; crime and trafficking victims; and persons fleeing persecution, all of whom are otherwise unable to afford legal representation. 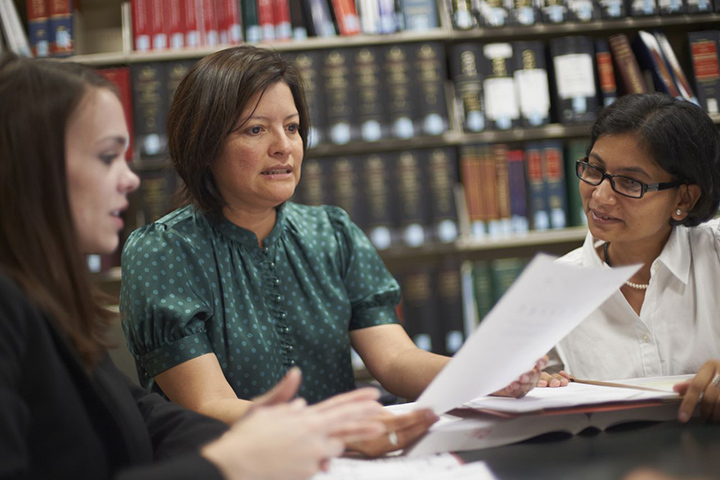 Through this work, the Immigration Law Clinic provides opportunities for students to practice a complex and often high-stakes field of law in a well-supervised, academically rigorous program. Students participate in both direct client representation and systemic advocacy, learning substantive immigration law and procedure as they assist clients seeking citizenship and other forms of lawful immigration status. In both one-on-one and group settings, students critically assess immigration law and policy, including proposed reforms and social justice issues, and analyze how these realities affect their client population and the world at large. Students also engage as important community resources for noncitizens and their families. These are necessary, daunting, and exhilarating learning experiences for a lawyer-in-training. Immigration law presents unparalleled complexities and rich client interactions. In problem-solving with our clients, our students learn to integrate legal research and analysis with effective client-centered advocacy. Students navigate their clients through a bewildering web of our immigration laws and regulations, analyzing issues of global and domestic importance that have life changing impact for their clients. The students’ advocacy on behalf of clients may take them before immigration court, state family courts, administrative agencies, or the federal courts of appeal. The students’ work at the Immigration Law Clinic is purposefully diverse, exposing them to the broad reach of immigration law as it interacts with an array of legal systems and social institutions. In addition to preparing evidence in support of their advocacy in court appearances and filings for affirmative immigration relief, some students may work in appellate and amici capacities while others may engage in outreach and reform efforts. For example, students may work to educate state and local law enforcement agencies about their role in opening avenues to legal relief for immigrant crime victims. I recently supervised two students who served as first and second chair on a full asylum hearing in Immigration Court. The students delivered opening and closing statements, examined and cross-examined witnesses, and engaged in all of the pre-trial preparation. Both the opposing counsel and the judge were impressed with the quality of the representation. Our clinic presents students with a unique range of cases, from children who are facing deportation from the United States, to victims of domestic violence, to refugees with disabilities confronting barriers to naturalization. The Immigration Law Clinic has represented clients from over 70 countries, and the circumstances of our clients’ cases are diverse. Many of our cases involve unaccompanied minors, victims of domestic violence or in-country violence. Students help clients to secure permanent residency, U.S. citizenship, and other legal status, such as that available to victims of human trafficking and other crimes. For example, we represent all the unaccompanied children in the custody of the Office of Refugee Resettlement in Michigan, most of whom are in removal proceedings and face the threat of imminent deportation. Working in the Immigration Clinic is a very rewarding experience because you are given the opportunity to be the lawyer. It is amazing to positively change someone's life through representing them. All materials have been prepared for general information purposes only. The information presented is not legal advice, is not to be acted on as such, may not be current and is subject to change without notice. The information presented is provided "as is" without representation or warranty of any kind. We do not represent or warrant that such information is or will be always up-to-date, complete, or accurate. Any representation or warranty that might be otherwise implied is expressly disclaimed.